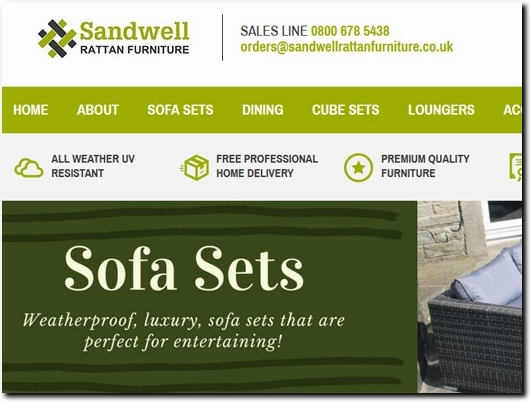 Offering first class customer service, free home delivery, easy returns and secure payments, Sandwell Rattan Furniture are the number one specialist rattan garden furniture online retailer. As a family run business, we strive to ensure that all our customers are completely satisfied with every aspect of our service, and we therefore dedicate all of our time before, during and after a sale to give our customers a personal service. We offer a great selection of rattan garden furniture and this includes rattan sofa sets, rattan dining sets, rattan sun loungers, rattan cube sets and rattan bistro sets. Our all-weather garden furniture sets are maintenance-free and can be left in the elements all year round. Gone are the days when you were forced to restore your rusty or deteriorating rattan garden furniture that had battled the British winter. Our outdoor patio furniture is PE rattan that is woven over a rustproof aluminium frame, meaning it won’t rust. Each garden furniture set is supplied with a 3 year structural warranty, and you can be sure you’re making a quality purchase with Sandwell Rattan Furniture. We include FREE delivery to mainland UK, with a 2 man white glove delivery service as standard and a choice of days for delivery. You even get a time slot for convenience so there’s no waiting in all day for the delivery to arrive. Buy your rattan furniture online or give our team a call on 0800 678 5438 if you need anything. UK (Leicester) based business providing rattan furniture for sale. Website includes e-commerce facilities, delivery and returns information, terms and conditions, associations, blog, full contact details including company registration number.